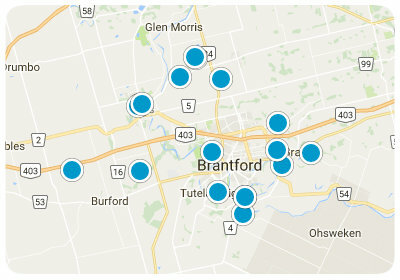 In the delicate countryside of Brantford, Ontario is nestled the quaint community of Henderson. Whether you are a homebuyer looking for the perfect house, or a family looking to relocate to a safer neighborhood, Henderson is a wonderful community that boasts a convenient location along with a host of activities and amenities for residents to enjoy. Take a stroll through Regent park, as you will be astonished by its beauty, elegantly maintained bushes, and purple leaved trees at the end of the park’s walkway. Also within Henderson are the gorgeous Devon Down and Spring Gardens Parks, lovely parks that are filled with seasonal beauty all year round. Gather friends and neighbours to play a game of soccer or to wear the kids out before bedtime. This large residential neighbourhood and network of streets will welcome you with its beautiful styles of homes. Homebuyers will be impressed with the amount of varied real estate that is available in this highly sought-after neighbourhood. Homes in Henderson come in a vast range of options and depending on the property’s size, style, and location can have varying price ranges. Single-family houses in this community can range from 1,000 to over 3,500 square feet. Along with older homes, you can find a variety of newer construction in the area. Henderson is a close-knit community where everybody knows their neighbours and looks out for one another. If you would like more information regarding homes for sale in Henderson, please allow us to assist you and contact us today.